Our meetings took on another form of life. We started pub hopping. We grew out of the Tavern and moved into the Naaz Bar. It was an old, smelly drinking hall behind a small restaurant. The wooden floorboards creaked and the roof was always threatening to collapse. Men would literally crawl out before we moved in for our Sunday meetings. We had to go in early to clean out the bottles and cigarette stubs. Dr. James Barton took it on himself to wash the red pan spit marks off the walls. It was a challenge BUT it was a hall and we needed a hall. We moved in and things took off. The hall was right in the centre of the bazaar so people could find us easily. The church was looking more multi-cultural than ever. Garbage pickers, people from the snake tribe, porcupine hunters, monkey trainers, students and staff from Woodstock School, Nepalis, Biharis, Punjabis, Tibetans, Germans, Irish, South Africans and on it went. There was no protocol, no religiosity and no formality. The poorer families would come in with their naked-bottomed babies who would poo and wee all over the place. They would sit and de-lice each other (and us) in the meetings. In the middle of a preach they would walk in and greet everyone loudly. Whoever was preaching would stop. We would all wave and return the greeting. 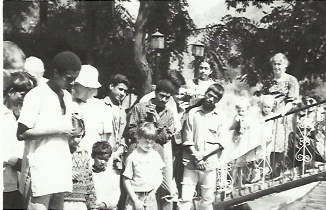 The kids were jungly and had never been told to keep quiet. A finger on the lips and a loud “SHHH” meant nothing to them. Our trips across the mountain to Lake Mist were interesting. We would pack any vehicles we had to full capacity. Our little jeep would sometimes have fourteen people in it. We would often have people on the roof rack. Those who couldn’t fit in vehicles would be packed into taxis. 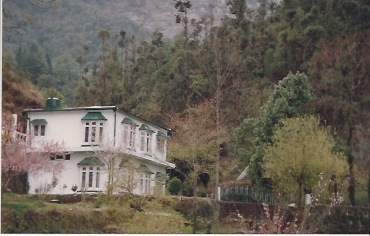 It was a lovely cottage in the hills, owned by Anil Kapoor of the Brentwood Hotel. He was a good friend of ours. Jordan’s dedication at Lake Mist with Shaun Cox, Graham Jones, the Hawthornes, Chandra and everyone else. There were lovely walks and a pool where we could swim and have baptisms. We had some interesting baptisms. On one occasion, we were all standing around the pool. 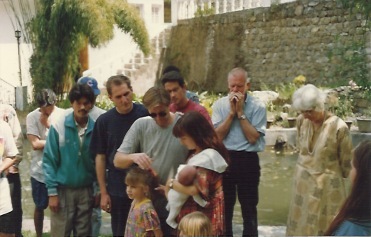 There were people squishing up on the little bridge to watch and about ten people waiting to get baptised. They had never seen a baptism before. The men, who were just in their underpants all shouted and jumped in. Fortunately it was shallow. They started splashing around and dunking themselves under the water. Someone called for order and they got out. We were laughing so much. They were like very happy kids. One after the other they shared their stories and why they wanted to be baptised. 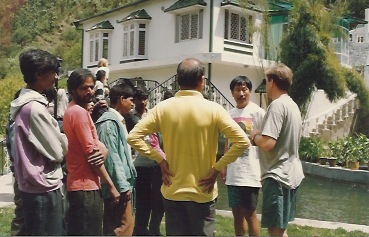 Anil had come from a very rough background. When he came up out of the water he got so excited that he swam “Indian e-style” across the pool. In his zeal he jumped out of the pool and sat on the edge. Everyone screamed and the girls closed their eyes. The cameras were put away and the video stopped. Anil had left his underpants in the pool.